Very simply, the best outer record sleeve we've ever come across. Ultimate protection and aesthetics in one package. These sleeves use a hybrid 2.5 mil polypro/polyester film. Rather than viewing your records through a cloudy sleeve, you'll instead see them perfectly crystal clear. And each sleeve is die-cut to exactly 12.75 x 12.75 inches. These sleeves are much more rigid and tight-fitting than standard outer sleeves. Again, if you want the absolute best and best-looking outer sleeve, look no further. Customer Reviews (4.33 Stars) 9 person(s) rated this product. GREAT but I wish they were a little bigger. I especially like these sleeves for their shininess and firm composition. The only thing is that some of those larger 2 LP sets won't fit easily. Even though, I prefer these to others I've tried and will be ordering them again. I was really on the fence as to whether I should purchase these or the heavier 5 mil sleeves. I must say that the 2.5's are quite thick and sturdy. I have not tried the 5 mil sleeves, but I can't imagine needing anything thicker than the 2.5's. They fit very nicely on single and double LP sets. By far the best outer sleeves I've used. In the past, I've often gone with the Japanese resealable type sleeves, but over time I have cooled off to that style due to the general inconvenience involved in using them. These are perfect and the price is quite reasonable. UPDATE: I just ordered a second pack of these and it seems I may have received the thicker 5 mil sleeves by mistake on my first order. The above review therefore is not accurate in proclaiming the thickness of these sleeves. Make no mistake, the 2.5's are fine and a good value however, I would definitely recommend the thicker 5 mil sleeves(unless you are buying a large quantity and need to save the $). So i decided to get some sleeves to start covering my extensive record collection and make everything look neat and tidy... These sleeves are ultra clear and easy to work with. They feel and look nicer than the thicker, less transparent plastic sleeves which i had been using. Some double LPs fit in quite nicely - such as the 180g Prince - 1999 but most of the bigger gatefold double LPs do not (eg. Diana Krall live in Paris 2x 45RPM 12") - it would be great if there was a solution for those too. All in all a great product, i've ordered another 100. These are the "cats meow" for album cover protection. Crystal clear and able handle double lp's with no problem. This outer cover is perfectly see through and a decent thickness. Seal-able covers tend to either be really expensive or thin and easily ripped. They can also adhere to the LP cover if you are not paying close attention. This is a good alternative. They are thick enough to protect your the LP cover and wide enough to easily house a double LP. 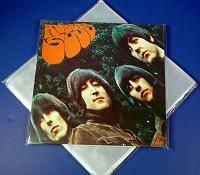 If you want your valuable LP's and their covers, properly stored and protected you should consider this sleeves. Beautifully clear & transparent, these have fit every album I've tried, no matter how thick & bulky (Ok, a few such as "Let It Be" were a tad snug, but they DID fit. These are the best I've seen, anywhere. Perfectly sized to just fit your favorite gatefolds and double albums. Crystal clear as well. My current favorite sleeve.